Gaulitanus Choir is proud to announce the 12th edition of Gaulitana: A Festival of Music. 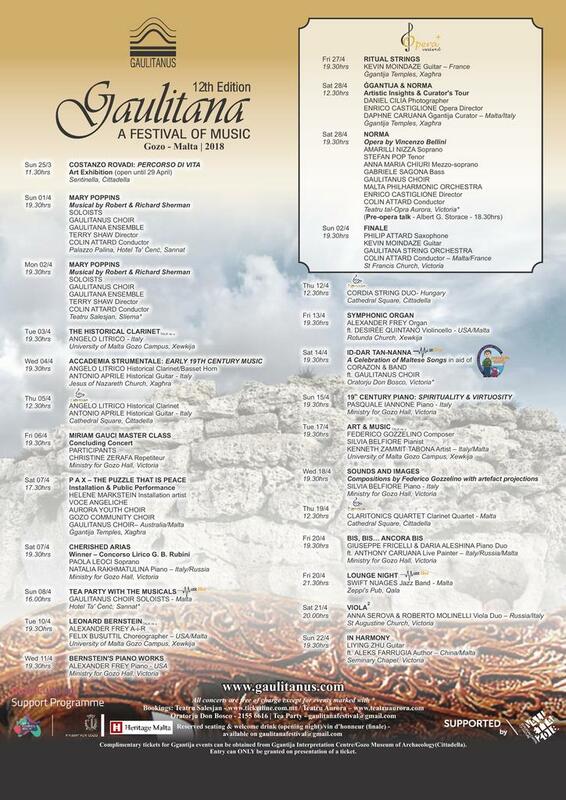 Running from 1st April until 29th April, 2018, “Gozo’s main classical festival” will feature a multifarious programme of events in various genres and styles. The highlight will be Bellini’s opera Norma, being held at the Teatru tal-Opra Aurora on April 28th. Colin Attard will direct the Malta Philharmonic Orchestra and the Gaulitanus Choir. The opera night will be part of the OPERA+ Weekend – an intensive programme of events concluding the festival. The festival is supported by Valletta 2018 and the Gozo Cultural Support Programme of Arts Council Malta in collaboration with the Ministry for Gozo.